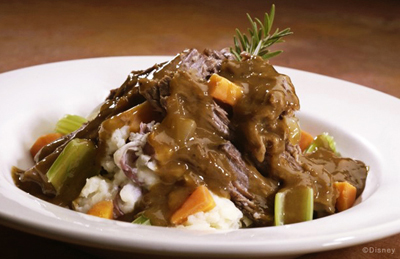 Bop into a fabulous fifties kitchenette at Disney’s Hollywood Studios where “Mom” cooks up classic favorites like meatloaf, fried chicken, pot roast and milk shakes. Meals are served up by relatives like Uncle Bob and Cousin Sue, along with “warnings” about not cleaning your plate or misbehaving at the table – all in good Disney fun, of course. 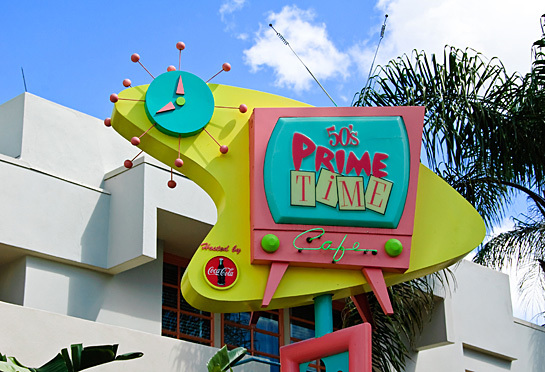 The decor at 50’s Prime Time Cafe is sure to take you back in time. Although I am a child of the sixties, I always feel like I’m stepping back into my childhood when I see some of the knick knacks and wall decorations – many are exact replicas of some of the things found in my Grandma’s house. You’re in for an extra treat when you get seated at a table with a TV. 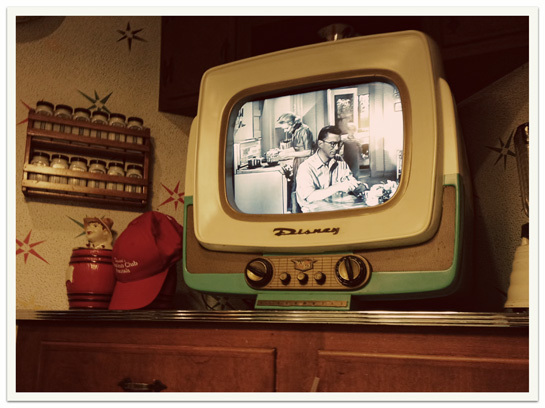 You’ll enjoy old black and white clips from popular prime time sitcoms like “Father Knows Best”, “Lost in Space”, and the original “Mickey Mouse Club.” It looks like David’s been here – I recognize his signature red cap sitting by the television. Good thing he took it off at the table. I’m certain he would have gotten a good talking to for that if he hadn’t! If you ever see David in the park with that red cap on, be sure to say hello. Next door to 50′s Prime Time Cafe, the Tune-In Lounge looks like a family den from the ’50s, with black-and-white TVs and campy retro furniture. You can choose kitschy drinks from “Dad’s Liquor Cabinet” like Uncle Tim’s Melon Margarita, Scooter’s Long Island Iced Tea or an Electric Lemonade. Beer and wine is offered, too. In addition to refreshing adult beverages, you can order anything from the 50’s Prime Time menu. I often eat here at the bar when I am traveling solo. If you’re looking for a big hit of nostalgia, coupled with some good old-fashioned comfort food and a hefty dose of Disney fun – you’ve found the place! Of course, so has everyone else so be sure to make reservations in advance, especially if you’ll be there at a busy time (like during free dining) – this is a very popular place. Coke blended with Vanilla or Cherry flavors – Unlimited Refills! 3 thoughts on "Dining Spotlight: 50’s Prime Time Cafe at Disney’s Hollywood Studios"
I usually do not have ISSUES at WDW restaurants, but this place has to be the worst I have experienced on or off property. The food was extremely basic (part of the premise, I guess), it was blah (lack of taste), and the service was horrible. No, I am not talking about the MaMa jokes, etc … it took our server more than 10 minutes to take our drink order. Even though we were rady to order our entrees, he would not take that order. 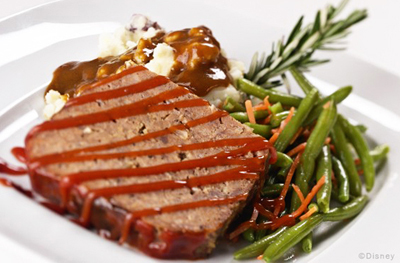 It took more than 45 minutes to get our food … MEATLOAF! It’s not something that is cooked to order … you slice it off of n existing loaf. In addition, the seating is horrible. Specifically, I am referring to how some tables are shoved into small spaces, or left nearly in the middle of main walkways. We had server BUTTS in our face (bending over), kids stopped to pick their nose as they walked by while others coughed on our food. I stopped counting how many people were looking at us as they walked to their table, either as they were entering / existing the restaurant, or going to/from the bathrooms. It was as if we were seated in the foyer of our house, between the front door, and the bathroom! That’s too bad that you had such a bad experience. Disney usually gets it right, but not every restaurant is a good fit for everyone. this would be the best menu and classic one. i wish i could be there.